The record-breaking rainfall experienced across Wisconsin this past summer and fall make clear that we must act to make our communities more resilient to heavier precipitation events and other climate change impacts that are already upon us. Clean Wisconsin, in partnership with the Milwaukee Metropolitan Sewerage District (MMSD), community organizations and neighborhood associations, continues to do just that by installing green infrastructure (GI) practices in underserved Milwaukee neighborhoods as well as educating and encouraging GI installations throughout southeastern Wisconsin. Practices such as permeable pavement, rain barrels and rain gardens capture and infiltrate rainwater, reducing the amount of stormwater runoff pollution washing into local waterways and Lake Michigan, as well as reducing the risk of basement back-ups and combined sewer overflow events. As consultants to MMSD, Clean Wisconsin has educated and engaged residents across 32 Milwaukee neighborhoods about the environmental, social, and economic benefits of GI, and have helped install these practices. This past summer, we worked with amazing MMSD Summer Interns Chad, Jasmine, and Djdade, as well as three young adults, Janiah, Treyvion and Marshuan, who interned with Clean Wisconsin through the Milwaukee Promise Zones Youth Employment program. In addition, Marek Landscaping provided rain garden training and Stormwater Solutions Engineering joined our team to install StormGuardens™, which are planter boxes with the capacity of 6.5 rain barrels. 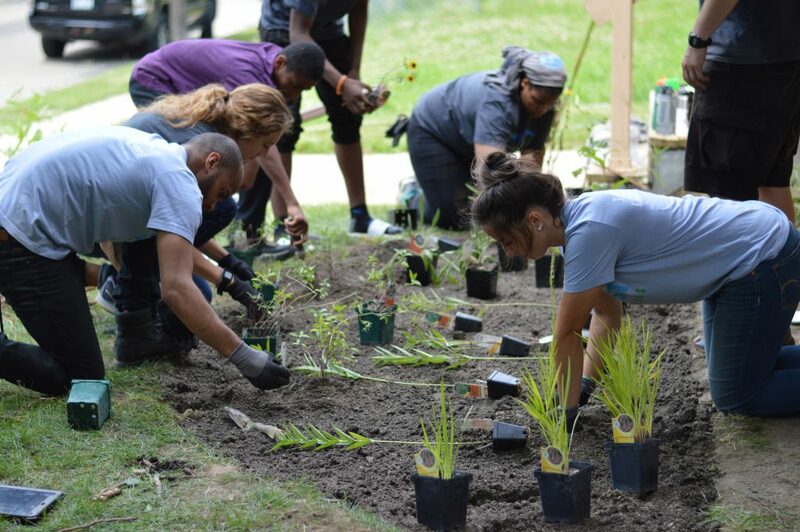 Since June 2018, our team has installed 120 rain barrels, 7 rain gardens and 7 StormGuardens™. Over the past five years partnering with MMSD, we have helped install 476 rain barrels, 47 rain gardens and 9 StormGuardens™. Cumulatively, these practices capture about 36,345 gallons of stormwater runoff pollution per storm, or about 1,817,250 gallons of stormwater pollution per year, while adding green space, providing pollinator habitat and strengthening neighborhood civic engagement. In addition to our on-the-ground work in Milwaukee neighborhoods helping to install GI, Clean Wisconsin has also become increasing engaged in GI education and ensuring that such practices are supported throughout southeastern Wisconsin communities to help improve water quality region-wide. In September, Clean Wisconsin completed a successful, year-long series of workshops aimed at a variety of potential implementers of GI practices. From residents to houses of worship to developers, we discussed ideal GI practices, funding and incentive options. Each of the ten workshops also included a testimonial from a person or entity that has installed these innovative practices on their property. The workshops attracted dozens of attendees and provided a fantastic opportunity for peer-learning and sharing best practices. We hope to continue these workshops into the future to continue educating and encouraging GI installations that make our communities increasingly resilient. Finally, in partnership with the Southeastern Wisconsin Watersheds Trust (SWWT), Birchline Planning and MMSD, Clean Wisconsin continues our work to remove barriers to GI that still exist in local codes and ordinances in municipalities throughout the MMSD service area, to ensure that all individuals, institutions and businesses that want to help improve water quality by installing GI are enabled and encouraged to do so. Learn more about our green infrastructure work.